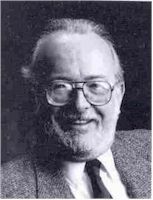 Paul C. Lauterbur was born 6 May 1929 in Sidney, Ohio. He received the B.S. degree in chemistry from Case Institute of Technology in 1951. Between 1951 and 1953, he worked as a Research Associate at the Dow Corning Labs at the Mellon Institute where he was involved in the studies of organosilicon chemistry, vulcanizing systems and reinforcing fillers of silicone elastomers. It was at that time he was introduced to nuclear magnetic resonance (NMR). In 1953, Lauterbur was drafted into the U.S. military and served two years in the Army Chemical Center Laboratories working on the biological testing of chemical warfare agents and studies on aerosols. While he was at the Army Chemical Center, he also set up the nuclear magnetic resonance laboratory and began research on NMR spectroscopy. Lauterbur returned to the Mellon Institute in 1955, working part time towards his Ph.D. in Chemistry, which he received from the University of Pittsburgh in 1962. Upon receiving his degree, Lauterbur joined the faculty of the State University of New York at Stony Brook where he served as a Professor in the Departments of Chemistry and Radiology. He was named as University Professor in 1984, and continued to hold the position of Adjunct University Professor at Stony Brook even after he left in 1985 to join the faculty at the College of Medicine and in the Department of Chemistry of the University of Illinois at Urbana-Champaign. At the University of Illnois, he held the post of Director of Magnetic Resonance Imaging Research. It was during his tenure at Stony Brook, and his sabbatical at Stanford that Lauterbur accomplished much of his work on NMR spectroscopy, furthering his inquiry into its applications to the studies of the structures of molecules, solutions and solids. He also extended his NMR studies to applications in biochemistry and biophysics when he discovered nuclear magnetic resonance imaging. His work at SUNY Stony Brook laid the foundations for the field of nuclear magnetic resonance zeugmatography, or nuclear magnetic resonance imaging, commonly referred to as MRI. The breakthrough, though now commonplace medical diagnostic instrument with this name is built upon his work, and his discovery provided a new field of endeavor for physicists, engineers and clinicians. Lauterbur published more than 110 scientific articles regarding various aspects of NMR and its applications. Lauterbur received many honors and awards, including an honorary Ph.D. from the University of Liege, Belgium, the 1982 Gold Medal of the Society of Magnetic Resonance in Medicine, the 1984 Albert Lasker Clinical Research Award, the 1986 European Magnetic Resonance Award, the 1987 National Medal of Science (USA), the 1987 Roentgen Medal, the 1987 Gold Medal of the Radiological Society of North America, the 1992 International Society of Magnetic Resonance in Medicine Award, the 1994 Kyoto Prize for Advanced Technology, the 1999 Gold Medal of the European Congress of Radiology, and the 2001 NAS Award for Chemistry in Service to Society. In 1985, he was honored with membership in the National Academy of Sciences and in 1987 he was awarded the IEEE Medal of Honor, 'For the discovery of nuclear magnetic resonance imaging." In addition, in 2003, along with Sir Peter Mansfield, he won the Nobel Prize for Medicine. Gill, Cindy. "Magnetic Personality." Pitt (Magazine of the University of Pittsburgh), Fall 2004. "Paul Lauterbur, Obituary." The Guardian (London), May 18 2007. "Paul C. Lauterbur, 77, Dies; Won Nobel Prize for M.R.I." New York Times. March 28, 2007. "Paul C. Lauterbur: Autobiography." Nobelprize.org. "Paul C. Lauterbur: Curriculum Vitae." Nobelprize.org. Hornak, Joseph P. The Basics of MRI. Center for Imaging Science, Rochester Institute of Technology, website. This page was last edited on 14 August 2017, at 15:04.